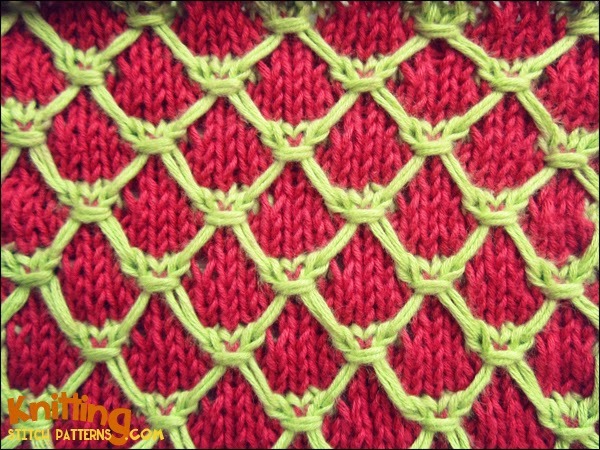 The cluster quilting stitch creates an outstanding diamond design that will give an interesting texture to designs like sweater and bags. Cluster: (wyib sl the last 3 stitches worked back to the left needle, pass yarn to front, sl the same 3 stitches back again to right needle, pass yarn to back) twice. With color A, cast on: multiple of 8 sts + 2. Row 1 (Wrong side): With color A, p1 * p1 wrapping yarn twice around needle, p5, p1 wrapping yarn twice around needle, p1; rep from * to end. Row 2 (Right side): With color B, k1, * sl 1 wyib dropping extra wrap, k5, sl 1 wyib dropping extra wrap, k1; rep from * to end. Row 3: With color B, p1, * sl 1 wyif, p5, sl 1 wyif, p1; rep from * to end. Row 4: With color B, k1, * sl 1 wyib, k5, sl 1 wyib, k1; rep from * to end. Row 5: With color B, purl, dropping all elongated Color A slip stitches of needle to back. Row 7: With color A, p1, sl 1 wyif, * (p1, p1 wrapping yarn twice) twice, p1, sl 3 wyif; rep from * to last 7 sts, (p1, p1 wrapping yarn twice) twice, p1, sl 1 wyif, p1. Row 8: With color B, k3, * sl 1 wyib dropping extra wrap, k1, sl 1 wyib dropping extra wrap, k5; rep from * to last 6 sts, sl 1 wyib dropping extra wrap, k1, sl 1 wyib dropping extra wrap, k3. Row 9: With color B, p3, * sl 1 wyif, p1, sl 1 wyif, p5; rep from * to last 6 sts, sl 1 wyif, p1, sl 1 wyif, p3. Row 10: With color B, k3, * sl 1 wyib, k1, sl 1 wyib, k5; rep from * to last 6 sts, sl 1 wyib, k1, sl 1 wyib, k3. Row 11: With color B, purl, dropping all elongated Color A slip stitches of needle to back. Row 12: With colot A, k1, pick up 1st dropped stitch and knit it, k1, sl 3 wyib, k1, * pick up 1st dropped stitch and knit it, k1, pick up next dropped st and knit it, CLUSTER, k1, sl 3 wyib, k1; rep from * to last st, pick up last dropped st and knit it, k1. Row 13: With color A, p1, * p1 wrapping yarn twice, p1, sl 3 wyif, p1, p1 wrapping yarn twice, p1; rep from * to end.